Everyone is raving about the JK Light as air foundation and this means I feel like I need it in my life! It's had really great reviews and a lot of beauty gurus swear by it. The price varies, but the cheapest I have found it is at BeautyBay.com. I nearly bought it on payday as they also had a 10% off deal on but I didnt. I do have enough foundations at the moment and should wait till one of them runs out! Check me out being sensible! I really am into layering this winter. 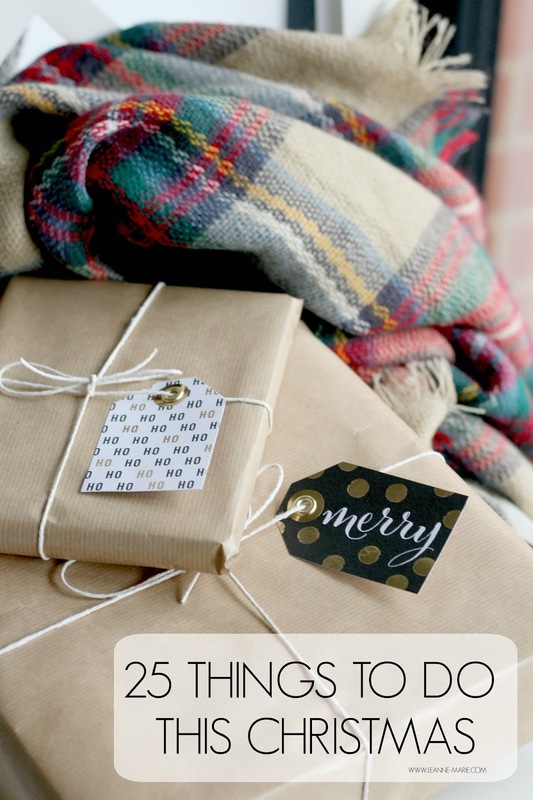 Taking my summer dresses and chucking on some thick tights with knee high socks and boots! 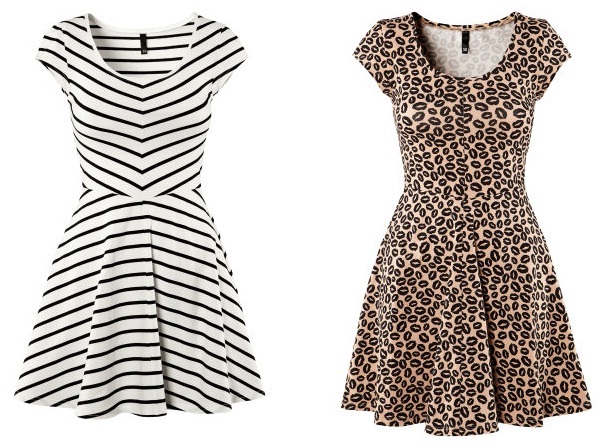 While browsing the H&M website, I came across these two dresses that I just need! At £12.99 they are so affordable and look like they would be a really flattering fit! I love the stripe dress, I wouls so wear it with wedge boots, black tights and a bright coloured cardigan. The leopard print-esque dress I would wear with my new brown boots also from h&m (which I will blog about soon) thick cream socks, black tights and a chunky knit cardigan! LUSH. 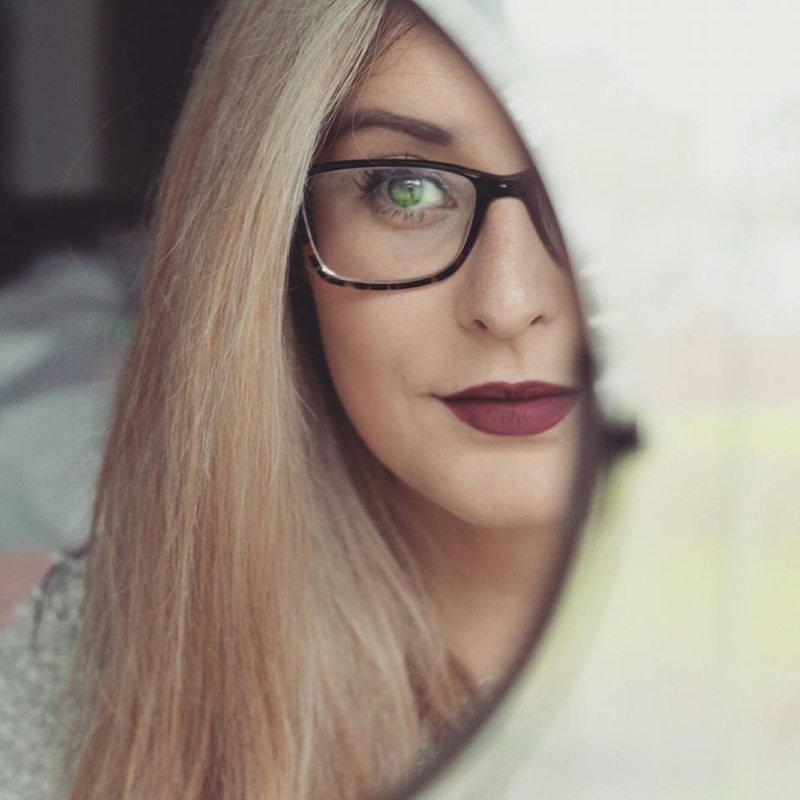 When watching Holly's (Yummy Mummy Beauty Blog) video about the products she was hitting pan/repurchasing, she made a very good point that not many people vlog or blog about the products they always repurchase or are planning to repurchase as they are impressed with the item. Its always blog posts or videos about the newest product in their collection. So this got me thinking...which products do I always repurchase...well thats easy, my eye makeup remover and concealer. This is my eyemakeup remover..its probably my 5th bottle of it?! So Its clear that it is a firm favourite with me! Its The Boots Botanics Soothing Eye Makeup Remover so gentle on your eyes and removes all my eye makeup effortlessly. At only £3.05 (not sure where that 5p comes from!) its an affordable product that does the job! I have introduced this to quite a few of my friends and they have agreed that it is an excellent 'drugstore' makeup remover. I do have the Liz Earle Cleanse & Polish hot cloth cleanser that I was kindly sent to review.. I will be using that and reviewing, once I have finished with this eye makeup remover! If you ask anyone in the beauty blogging community what is a good 'drugstore' concealer I'm pretty certain most will suggest this one. Its the Collection 2000 Lasting Perfection Concealer. I would say this is possibly my 3rd tube of it. It's definately more expensive than when I first repurchased it, but at £4.19 it's still not too bad really! It has great coverage and comes in a nice selection of shades. Perfect for hiding my dark circles and any nasty blemishes that come my way! So what products do you always repurchase? After picking up the Pleasures of Paris palette a couple of months ago, I have been drawn to the Nars palettes. I love their eyeshadows and think that buying a palette is a more money savvy way of trying out different shades instead of buying them individually! Plus theres always such a great range of shades within one palette so I know I will use them all and get my moneys worth! I picked up this Modern Love palette from ASOS, when they had a bit of a discount on certain beauty products. I admit that £31 for the palette seemed much more acceptable for me to spend rather than £39, it was in my basket and I was heading straight to the checkout. (On a side note, I do love that they do a super saver delivery option which is free - perfect when you are buying items that you dont really need in a rush! To be honest the delivery doesnt take that much longer either so I dont know why more people dont choose this option!) They currently have a 25% Student discount going on so with super saver delivery you could get it for just £29.25! - Cheaper than what I paid! As you can see they are all really wearable shades. Some of which you could wear on their own for a quick wash of colour over the lid, or you can combine two or more shades for a more dramatic eye makeup look. I'll be honest I havent had that much of a chance to play around with the colours yet, but just by looking at the eyeshadows in the pan I can see lots of different combinations for a variation of looks! So excited to start experimenting with it! Do you have this palette, or maybe you now want it? (Hi Maxine! :-p) I think its a lush little palette that would be great for everyone thanks to the great range of shades! Review : 'Harmony' Intensive Care Treatment from Neal & Wolf. Some of you may have heard of the brand Neal & Wolf before, would I be correct in saying that you found out about them thanks to Glossybox? I'll admit, thats where I first heard about them. Back in the September Glossybox, some subscribers were lucky enough to nab a Neal & Wolf product in their box. You got either the Glow Super shine spray or Harmony Intensive care treatment. Unfortunatly I did not recieve any products from the range which I was quite dissapointed about, however the lovely Samara from N&W offered to send me one of them to try out and review, so as my hair was in need of a bit of TLC i chose the Harmony treatment. It really does smell lovely, it is quite a musky scent but it's not one of those 'old lady' musky scents that a lot of people dislike! The scent lingers on my hair after Ive styled it so I keep getting wafts of it throughout the day which is nice! Straight after using this product on my hair I noticed that my hair was a lot less tangled than it usually is and my trusty Tangle Teaser combed through my hair with ease. So if you are one that suffers with knotty hair after a shower, this is a must for you! Once dried fully and styled my hair looks a lot more healthy and shiny.I have been using this once a week regularly and I can honestly say my hair feels a lot nicer and I put it down to using this treatment. It retails at £12.95 for 200ml and £25.95 for 950ml, which you can get from their website. For me personally this product will be repurchased as I have seen great results on my hair after using it. Have you tried out any Neal & Wolf products before, do you want to? The current must have item in the beauty blogging world would have to be the OPI Rainbow Connection from the Muppets Collection. Yes I tinkered with the idea of buying it from ASOS with a cheeky bit of discount but instead I decided to hunt out for a possible dupe..and I found one. At first glance it's pretty clear this has the same multi packed glitter as the OPI one, they are pretty much identical! The best thing though, is that the Milani polish retails a lot cheaper, the downside being I think you can only get it from the US. With the current exchange rate it works out about £2.50. I bought mine from Cherry Culture, which is a site I have mentioned previously when talking about my NYX Glitter polishes. Yes you do pay more for postage - I think it was around £7 But they have such a great range of brands on their site, once you're browsing you find more things you want to buy and it makes it all worth while! Delivery wise, they are pretty good, It took just over a week I would say for them to arrive. Not bad at all. Unfortunately I dont have the Rainbow Connection to do a side by side comparison but the lovely Louise has done a blog post on it, so hop over to her blog and you can see how similar they really are! So will you be picking up OPI Rainbow Connection or going for the more money savvy version of Milani Gems? 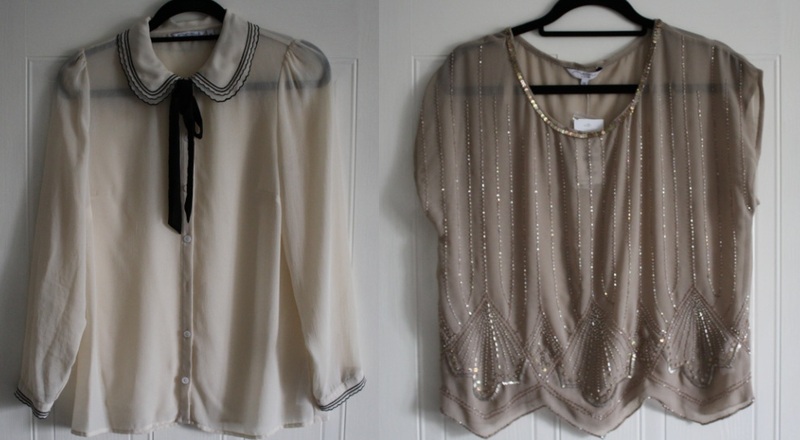 I just thought I would share these two pretty tops that I recently purchased from New Look. My sister has just started working in there, so keeps purchasing items with her discount.. I then see said items and need to have them for myself! Firstly I got this Double Collar Blouse which has the cutest collar and cuff detailing! I bought this and then saw Zoe wearing it in one of her haul videos! Its just so girly and elegant looking. I love wearing it with skinny jeans or tucked into a high waisted skirt for work! As I may have mentioned before. I dont really go out on nights out that often. I'm old and boring and really only go out on nights in the town for friends birthdays or other special occassions. Gone are the days where I have to be out EVERY weekend! Having said that, there are occassions where i will go out on a bit of a spontanious last mintue gathering in town with my friends. This always means I am faffing trying to find something decent to wear! So when I saw this Art Deco Top (Unfortunately this is no longer avaliable online but may still be in store! ), I had to have it as its the perfect top to just quickly throw on with jeans and some heels and still be glammed up! I love the bead/sequin detailing on it, altho Ill be sad if any of them start to fall off! So are you anything like me, and are getting to that age where you need some full proof 'night out' attire for those spontanious moments? - I think this is a sign im getting old! haha. When i took my trip to Cardiff (that was so long ago now! ), Charli and I went on a little shopping trip into the city centre. I don't think either of us had set out on a mission to spend money, just to have a browse around, check out some makeup counters swatch a few bits etc. In the end we ended up having our makeup done at the Illamasqua counter in Debenhams. This blush wouldn't have been one of the items I would instantly reach for as in the pan it looked quite a dark pink (twell for me it looks dark!) and I didnt think it would suit my skin colouring. However when Charlotte put it across my cheeks I thought it looked lovely! I was instantly sold! The blush has gold glitter running through it, now I am not one to shy away from a bit of glitter, its not a bad thing in my opinion, its just with some products theres too much packed in so you end up looking like a discoball if you arent careful! However Ambition has just the right amount of glitter to give you a nice looking glow on your cheeks, as well as a hint of pink colour. The colour is really easy to build up, so you could go for a subtle glow if you use a light hand or be a bit more heavy handed for a more daring brighter look. Have you bought anything from the Theatre of the nameless range? There's a lot of lovely products! If I could I would have a bit of a spending spree on the Illamasqua website! Save or Splurge : River Island Platform Ankle Boots. Tan Pair | Black Pair. So you can imagine my delight when these popped up on my screen while searching for black ankle boots. As you can see these are very similar to the River Island ones pictured above (ok they arent identical but its close) however at a fraction of the price at £32.95 + postage. 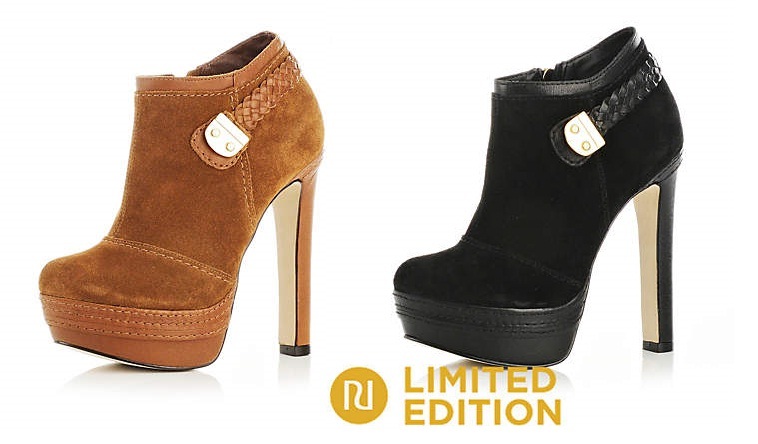 Both are platformed, have the plait strap detail around the back and gold fastening on the side. Admittedly the soles are a different colour on the Ebay ones and the River Island ones do look a bit better, however if you're on a budget these would be a good alternative. So have you ever managed to find a item of clothing or pair of shoes because you shopped around and found a similar style for a more money savvy price? I am a magpie. I just love anything that sparkles, especially glitter nail polishes. They instantly freshen up a manicure if you've got a bit of chipping and dont have time to re do all your nails again. They are great for parties and the festive season as you can get such a variety! I was browsing the Cherry Culture website, where I came across the NYX Girls polishes... now there were a lot of glitters to choose from but I decided on the following three; Super Funk, Carnival & Dreamy Glitter. All very different from one another. I loved the shade of the Super Funk polish, I liked (from the swatch online - if you can even call it that?) The large glitter particles looked like they came across quite sparce on your nail, therefore it would be a perfect polish just to give your manicure that something extra. As you can see from the swatch, it does apply quite spaced out which is something I love. Obviously you could build it up with more coats if you wanted more coverage. But I like it how it is after one coat personally! I havent seen another polish like this in this colour purple so this is one I definitley advise you to pick up! I chose Carnival as it reminded me a lot of 'Happy Birthday' by Deborah Lippmann I have been looking out for a more affordable dupe for this polish as I cant justify spending £16 on it! At $1.99 This was a very affordable alternative (of course you have to take into account exchange rates and shipping costs, but you still pay a lot less) it is also quite similar to the new Rainbow Connection polish by OPI. This could also be a good alternative which you could build up using more coats for a more opaque look. ﻿It is very easy to apply, You dont need a lot of coats to get a good coverage. If you wanted to go all out for a party you could do a few coats over a white polish to give you that wow factor. But as a general "I want to have a bit of sparkle" one coat will be enough. Finally I picked up Dreamy Glitter.. as I felt it would look fab over nails painted in a light shade. The flitter is really fine therefore it's one of those polishes that adds that little something extra to a simple look. Its much more understated compared to the other two polishes I picked up. But I still love it! One coat of this is perfect to achieve a bit of sparkle. As well as the smaller and more chunky bits of glitter throughout the polish theres also the added extra of little star shaped glitter which is really cute! So like I said all these polishes retailed at $1.99 which is a bargain! Carnival is 10ml , Super Funk & Dreamy Glitter are 12ml. I think they are great value for money, and as they are glitters you arent necessarily going to use them all the time so they will last you ages! If you would like to see any of these polishes over other colours, please let me know in the comments and I will put together a post for you. Collection 2000 Lasting Perfection Concealer in Light. Illamasqua Skin Base Shade 11. Topshop Gel Liner in Ink. Dark Brown Eyeshadow from 28 Netural palette.